A science fiction horror thriller, Pitch Black (later re-released on DVD as The Chronicles of Riddick: Pitch Black) introduces the character of Riddick in a solid if patchy adventure on a hostile planet. Deep in space, an interplanetary merchant ship is damaged by a comet storm. With the captain killed, docking pilot Carolyn Fry (Radha Mitchell) crash-lands the stricken craft onto the surface of a seemingly deserted barren planet. 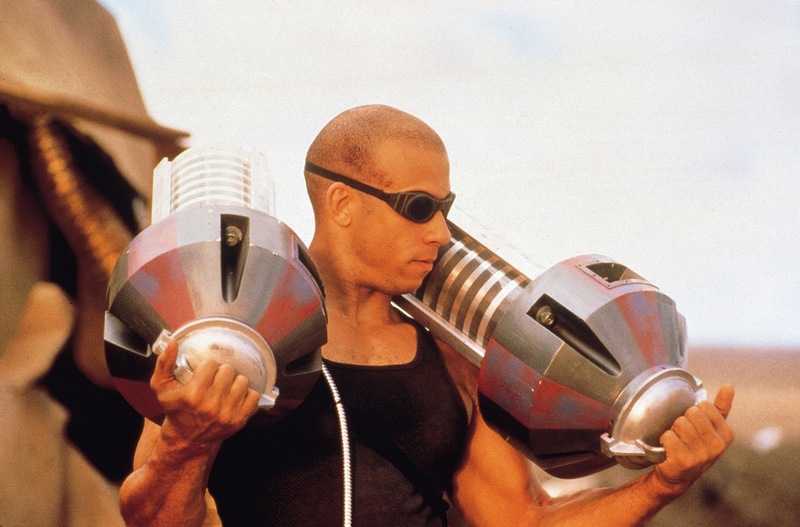 The survivors include convicted murderer Richard B. Riddick (Vin Diesel), who is being transported by his captor bounty hunter William Johns (Cole Hauser). A Muslim Imam (Keith David), his children and a mysterious boy Jack are among the others who emerge from the wreckage. The survivors stumble upon a small but abandoned outpost set-up by a geological expedition years prior, with a dropship in near-working condition. They also encounter monstrous killer creatures who live in caves deep below ground and can only survive in darkness. Riddick initially takes the opportunity to escape, but then strikes an uneasy deal with Johns to help the group survive. Fry believes they can repair the dropship and use it to escape, but the group discover that an eclipse will engulf the planet in darkness, giving the predatory creatures an opportunity to emerge and feast. A mix of low-budget Aliens and humourless Tremors, Pitch Black may lack funding and fundamental originality, but makes up for it with better than average character dynamics. Riddick is an impressive anti-hero, a reluctant prisoner with a troubled background happy to kill on demand but with a humanity throbbing somewhere deep in his damaged soul. His surgically modified eyes, allowing him to pierce through the dark but needing shades for the light, is a nice touch. Riddick also gets to deliver a few deadpan lines of dialogue. Providing the counterbalance to Riddick are three other survivors also worth knowing. Johns tries to pass himself off as the law, but he is less than he pretends, with weaknesses of his own. Fry, with Radha Mitchell in excellent form, is the reluctant leader, haunted by the decisions she had to make during the crash landing. And the Imam is another neat addition, a Muslim cleric and father introducing an uncommon tone. But director and co-writer David Twohy has other challenges, probably budget-related, that cause a few stumbles. Much of the action is in the dark and not very clear, and some of the dialogue is mumbled and drowned out by the sound effects. The computer-generated creatures, mostly indistinct cousins of the Aliens, are a study in quantity not amounting to quality. Still there are a few impressive visuals and the use of colour is inventive, Twohy and his cinematographer David Eggby creating a stark, scorched planet environment perfect for a severe survival test. And several of the death scenes are suitably sharp and brutal. Pitch Black was Vin Diesel's breakout role, and also launched the intermittent Riddick franchise, a welcome reminder that movies are not totally dependent on comics for hero inspiration. Pitch Black could have used more polish, but nevertheless lights up with gory thrills and impressive heroics.